FROM THE RECTOR We have had a number of school tours in the past month, we had four 6th Classes, students from St. Maelruan’s (note the different spelling! ), over a four day period and then we had a visit from Scoil Iosa and on 9th October we had a visit from Sacred Heart School. I enjoy the young people and their questions where I try to point out the differences and similarities between our two denominations. On 2nd October the church was beautifully decorated by the ladies – thank you all so much – for our Harvest Service on Sunday 4th at 3.30pm. We were delighted to welcome our new neighbouring Rector of Crumlin, Rev’d Ruth Noble to preach at the service and also to welcome The Leinster Singers. In the last couple of years we have moved the Harvest service to Sunday afternoon from Friday evening, following on from the success of moving the service during our Flower Festival. The Church was full, despite the Ireland v Italy match in the Rugby World Cup later on that afternoon! Rev’d Ruth Noble spoke to us on our looking after our own ‘spiritual garden’ and used the analogy of preparing the ground, sowing the seed, tending the plants and reaping the harvest to remind us to mind our own spiritual harvest. We were delighted that most people came over to the hall for the sumptuous tea provided by the ladies of the parish, who again I would like to thank most sincerely. On Mon 5th I was present at our Primary School to receive a tricolour and a copy of the proclamation from our neighbours, the Air Corp, Baldonnel, in preparation for next year’s 1916 centenary celebrations. We were pleased to welcome the O’Halloran family on Sunday 18th for Anne’s first anniversary. We will be dedicating 12 prayer books on Sunday 22nd November in memory of Anne at the family service followed by coffee. Sunday 25th was a busy day following on from our very well attended Family Service and coffee provided by the Boy’s Brigade I managed to get over to Crumlin Hospital to visit one of our BB boys, Daniel, before attending the joint birthday celebrations for parishioners; Mum, Dr Elizabeth Ogunjimi, teenage daughter, Natalie, and toddler son, Joshua in the Maldron Hotel. In true Nigerian tradition there were tributes to the birthday celebrants and it was a lovely occasion to meet up with Elizabeth’s family and friends, many of whom I had met at Joshua’s baptism. The 2015 United Nations Climate Change Conference, COP 21 will be held in Paris from Nov 30th to Dec11th .The objective is to achieve a legally binding and universal agreement on climate, from all the nations of the world. Scientists have warned that if greenhouse gas emissions continue to rise, global warming may become catastrophic & irreversible and that the threshold is estimated as a temperature rise of 2C. On current emissions forecasts we are heading for a rise of about 5C. That may not sound like much, but the temperature difference between today’s world & the last ice age was about 5C, so seemingly small changes in temperature can mean big differences for the Earth. There will be a Global Climate March in cities all over the world on Nov 29th . Attend the Dublin march, meeting at The Custom House at 2pm & write to you TD’s to participate in a world wide demonstration to save us! REMEMBRACE SUNDAY there will be a Remembrance service on Sunday 8th November at 10.45am before the Girl’s Brigade enrolment service at 11.00am. BAPTISM On Sunday 11th October Harvey Ricko Berkeley was baptised, baby son of Jonathan Berkeley and Aisling Connolly. Please pray for Harvey and his family as he begins his Christian life. DATES FOR YOUR DIARY Our annual CHRISTMAS SING ALONG takes place in the Parish Centre on Friday 4th December at 7.30pm where we sing Carols and Christmas songs, we have a Gift stall, a raffle and have refreshments of wine, tea, coffee and mince pies. Please do what you can to help, buy / sell raffle tickets, donations of wine, mince pies and donations to the gift stall would be greatly appreciated. Please phone Ronnie Scott 086 804 5090 for more information. Come along and get into the festive spirit! THE LEINSTER SINGERS will be having their CHRISTMAS STORY CONCERT in the Church on Saturday 5th December at 8pm in aid of refugees. 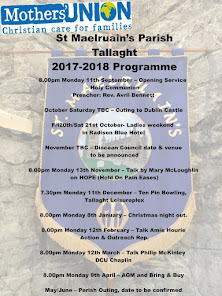 ‘TALLAGHT CHURCHES TOGETHER’ FREE CONCERT OF HOPE on Sunday 19th November in the Maldron Hotel at 7.30pm with some of the music groups from the seven churches involved. TAX REBATE The Hon. Treasurer would like to remind those who received a letter from him recently regarding the tax rebate that the parish can claim on giving over €250 annually, and who have not returned the enclosed form, if they could do so immediately, as the return needs to be sent to the Revenue Commissioners. Thank you in advance for your co-operation. COOPERS?? You may be aware that 1c and 2c cooper coins are being rounded up and we expect ultimately phased out, since the end of October? There is a JAR in the church for all the coins that you may want to donate, the parish will gladly except you coins, every cent counts! WHIST DRIVE The next Whist Drive takes place in the Small Hall of the Parish Centre on Mon 16th November at 8.00pm, all welcome! BOY’S BRIGADE The BB ran a coffee morning in aid of BB funds, on Sunday 25th October, we would like to thank everyone for their generous support. It was lovely catching up with everyone. A special thanks to Barbara Barrett, Catriona McCoy and Yvonne McGlynn. Thank you. We will be having our anunal enrolment service on 8th November at the 11am service. We also have room for some more boys if you would like to pop down on a Friday evening. Or contact Susan Carroll 0852853398. 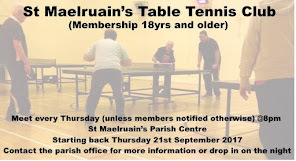 TABLE TENNIS We continue to play on Thursday nights in the Parish Centre. We are delighted to welcome Miriam Gibney to the club this year and hope she is enjoying table tennis with us. We have lots of room for more members, all standards welcome. We play 8 to 10 pm on Thursday nights in the parish centre. our sincere sympathies to Hazel Ian Jonathan and family. We wish Imelda Bird a speedy recovery after her recent operation. We are delighted to see Sam Mahon back after his operation. We are delighted to welcome our new members and hope they are enjoying our Tuesday evenings, we meet at 1930. We are looking forward to our club and league matches. 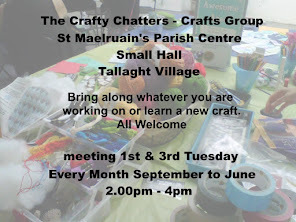 CRAFTY CHATTERS Crafty Chatters meet on the 1st and 3rd Tuesdays of each month (Tues 3rd and Tues 17th November) in the Small Hall. Please come and join us for chat, crafts, good company and fun. Bring along whatever craft you are working on or learn a new one. All Welcome! 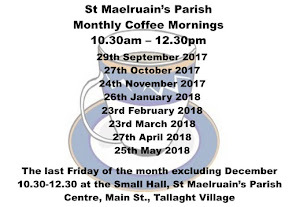 PARISH COFFEE MORNING Just a reminder that the dates for our next Coffee Mornings are the last Friday of the month, 27th November, 10.30am – 12.30pm as usual in the old hall. All welcome! MOTHER’S UNION On Saturday 17th October fourteen of us (including two grandchildren) met at the church and travelled in by Luas together to Kilmainham Gaol. We had an excellent tour guide which brought alive for us how Dublin's Kilmainham Gaol held some of the most famous political and military leaders in Irish history such as Robert Emmet, Charles Stewart Parnell, the 1916 Rising leaders and Eamon de Valera. It was very poignant being in the chapel where Joseph Plunkett wed Grace Clifford. SAOIRSE : For November donation they would like floor or surface cleaners, spray or liquid. We managed to deliver a few black bin bags (October donation) so if you would like to also contribute these, it would be greatly appreciated. Mothers Union DIARY DATES: 11.15am Thursday 5th November Christ Church Cathedral. As this service includes Tallaght we hope some members can attend. Tallaght members to help provide tea afterwards. Friday 13th Nov. Friendship Dinner – Springfield Hotel, Leixlip. Sunday 22nd Nov. Following Morning Service, we will host a MU Fund raising coffee morning. All branches have been asked to do this in 2015, monies raised go towards projects here such as holiday short breaks for families in Ireland and aid for MU work overseas. Also on Sunday 22nd Nov. prayer books in memory of Anne O’Halloran will be donated by her family & St Maelruain’s Mothers Union where she was such a loyal member and is fondly remembered. Monday 14th December: Christmas Quiz. Bring along your favourite Christmas treat to share. CROSSROADS is a Church of Ireland Social Club for those in their 20’s, 30’s and a little older….. they meet on the last Friday of the month in Buswells Hotel, Molesworth Street. 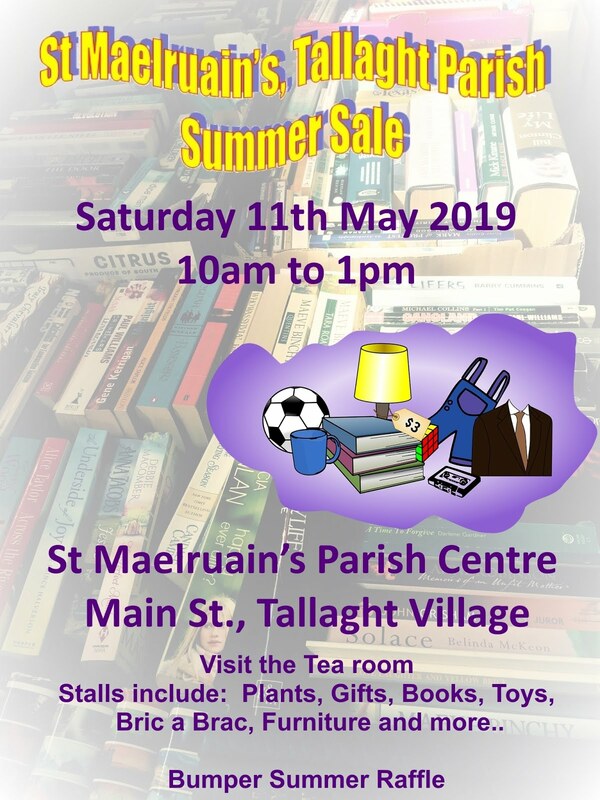 For more details contact David on 085 727 2019.